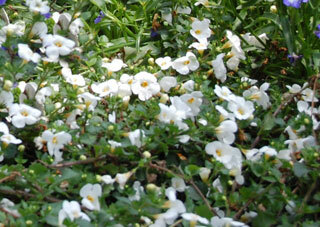 Long cascading stems and small white flowers make this annual perfect for window boxes and hanging baskets. Called a “spiller” in the nursery industry, it ‘spills’ over the side of the container, softening its edges and often touching the ground. Distinguishing Characteristics: Tiny white flowers and long cascading stems.